Keeping with the snowman theme I made a placemat from a new Bente Malm pattern. It was quick and fun to sew! It seems like I have a thing for snowmen... I just love them!!!! They are adorable :-) I really hope we'll get some more snow here soon so we can make some real snowmen in our yard before Christmas! Talking about Christmas.... 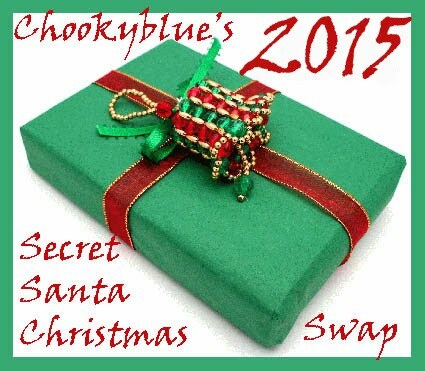 It is THAT time of year again.... time to get those SSCS gifts sent off to their destinations. Mine was mailed out on Thusday, and I hope it reaches it's new home in time for Christmas! Cute snowmen projects and you can use them longer than Christmas projects. 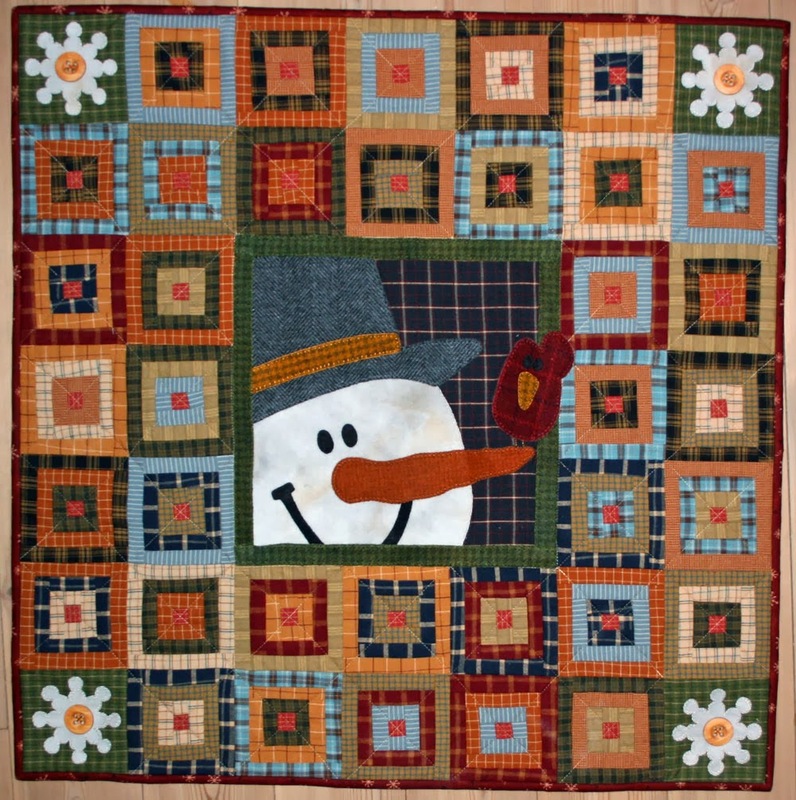 Your snowman quilt is adorable…so happy…like the placemat too…hope you get some snow to make a real snowman, must be fun to have real snowmen at Christmas (or any time for that matter!). Your quilt just made me smile! Love the placemats too....hope you get some snow soon! En underbar quilt med snögubben i mitten och snöstjärnor i hörnen, tycker jag. Och härliga färger har Du använt Dig av! It's a good darn thing you love snowmen -- given where you live LOL! Your snowmen are adorable -- I especially love the pieced blocks around the first snowman! I love it! 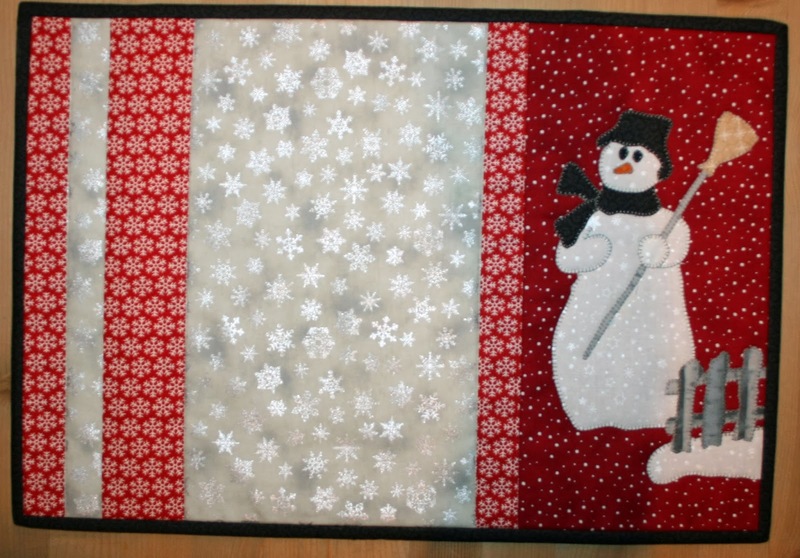 Your snowman quilt turned out so cute! You are on a great finishing roll.